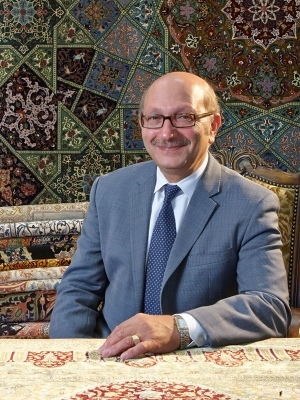 Third-generation rug expert Mansour Yaghoubian is one of this country’s foremost authorities on fine Oriental and Persian rugs. He was educated as an engineer at CSU Sacramento, but soon after graduation he realized his original passion for heirloom-quality rugs would be his life’s work. 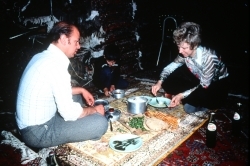 He opened his first rug gallery in 1979. “I love my job,” he says. “Being surrounded by my beautiful rugs calms my spirit. I’m a very lucky man.” He and his staff take great pleasure in sharing their knowledge with clients. A visit to Mansour’s Oriental Rug Gallery in Sacramento or Roseville is to experience timeless, truly magnificent works of art. The two galleries contain almost 8,000 rugs in an amazing array of shapes, sizes, rich colors and sumptuous textures. Mansour has gathered the rugs—antiques and contemporary creations alike—on his excursions to the hand-knotting rug capitals of the world: India, Pakistan, China, Iran, Turkey. He finds his treasures in cities with centuries-old rug-making traditions, such as Qum, Naeen, Esfahan, Kashan, Heris. This year, Mansour celebrates his 34th year in business. Newspapers, magazines and trade prints have covered him and his career since the beginning. He looks forward to every single day and treats his clients with graciousness, kindness, courtesy and respect. “We take time to understand our clients, to learn about their homes and what types of designs and colors they like,” he says. “Once I know their tastes, I can go to my collection and find exactly what they are looking for.” In fact, some of Mansour’s clients say he knows what hand-woven persian rug they’ll love before they do. Using his astute eye for quality and beauty, Mansour has personally selected each of the silk and wool Oriental rugs, tapestries and ottomans in his collection. He chooses pieces with prized urban and tribal designs and motifs, in addition to singularly unusual and personally commissioned works. Mansour’s Persian rug and Oriental rug selections range in size from 1-foot by 1-foot up to palace size: 22 feet by 33 feet. Shapes include round, square, rectangular, octagonal. Almost any shape imaginable. That business philosophy of excellence-first has served him well. For more than three decades, Mansour’s clients throughout the Roseville and Sacramento region have trusted his integrity as a businessman and his exceptional eye for quality, design and color. He has worked to develop his natural talent and good taste, just as he studied diligently in his early career to learn the rug and textile trade from his father and great-uncle. They taught him that Persian rugs of rare quality result when superior silks and wools are given to those who possess skill and artistic intelligence.